1 – Replenish missing vitamins and minerals for picky eaters with the right high potency supplement. *Be sure to add a multi B Vitamin which specifically includes B6 (P5P) and B12. NOTE: Many Multi B-Vitamins contain B6 (as pyridoxine aka HCI), but hunt and find the correct B6 (as pyridoxal 5-phosphate aka P5P) version for optimal results. 2 – Restore essential fats and oils for brain health and nerve processing with a good fish oil, flax oil, chia seeds, and/or flax oil supplements, and ample servings of organic eggs, nuts, seeds, and grass fed meats. *Visit your local grocery store, Wholefoods or Vitamin Shoppe for high potency OMEGA 3-6-9 oils or capsules. Check the DHA/EPA ratio for your child’s specific needs. 3 – Yank all processed food. Period. Ditch everything with corn syrup, artificial sweeteners, colorings, flavorings, added sugars, dyes, and genetically modified foods. Replace with whole foods, real food, home cooked food as much as possible. 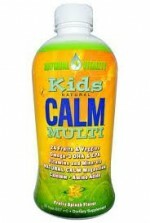 *One of our suggested “Starter Kits” for young children who can’t swallow pills, is a wonderful product by NATURAL VITALITY called “Kids Calm Multi” which contains everything you need above, plus calming Calcium/Magnesium in a one-dose liquid form. It comes in a tasty fruity-splash flavor to be mixed with your child’s favorite juice. 6 – If your child has interrupted or light sleep, try adding Melatonin chewable tabs or liquid at nighttime – available in 1mg, 2.5mg, 3 mg and 5mg. Dosage will depend on child’s age and weight. 1 – Nutrition deficits can cause lifelong impairment in learning, IQ, and development. More than half of children with special needs including autism may have nutrition problems big enough hinder them. Regardless of other therapies, do everything you can to optimize your child’s brain and body for growth and learning, with good nutrition. Without this, the brain functions below potential, and your child may not get the full benefit of other therapies. The earlier children receive optimized nutrition, the better, but you can begin at any age. 2 – In the US, physicians get little to no meaningful training in nutrition. They are not trained to apply diets and nutrition as therapies in general, much less for children with developmental disabilities or autism. So to get started, be sure you also talk to families who have succeeded with nutrition and special diets for their children with autism. For provider resources familiar with this intervention, visit TACANow.org. 3 – Nutrition and diets treat the nutrition and gastrointestinal problems children with autism have, not the autism itself. A “side effect” of these treatments is that the brain and whole body function better. This would be true for any child with a nutrition deficit or gut disease. Get your child assessed by a knowledgeable physician or licensed nutrition professional for these problems. For more on how to do that, see Special Needs Kids Eat Right. So You Want To Try “The Diet”. Where To Start? Guess what? There is no “diet for autism”. There are several nutrition approaches, including various diet strategies, supplement procotols, and gut health tools. Which one is right for your child? Though each child may have different nutrition priorities, there are many common nutrition findings for kids with autism spectrum diagnoses. So, it’s reasonable to start with these tips below, to replenish your child toward better health and functioning. For more detail on how to thoroughly launch a successful intervention, see Special Needs Kids Eat Right: Strategies To Help Kids On The Autism Spectrum Focus, Learn, and Thrive. If you don’t see any progress, don’t give up – this likely means your child’s biggest nutrition problems remain undiscovered, not untreatable. Get help from others who have succeeded, talk to knowledgeable professionals, and check for meetups and support groups in your area. 1 – Kids with autism are legendary for picky appetites. Having reviewed hundreds of food intakes of kids on the spectrum, I can vouch for that. Their diets tend to be weak for minerals – so, mineralize! Put back missing vitamins too. These are critical co-factors for learning, mood, sleep, and energy. Give your child a high potency multivitamin and mineral supplement daily. Pick the format best for your child: Chewable, liquid, capsule, or powder. Then get started. Multi’s built for this task may not be on store shelves, such as these examples, available from health care providers or on the web: ProThera VitaTab, Klaire Labs VitaSpectrum, or Kirkman Labs TheraResponse. Each of these delivers high potency minerals with full dose or higher for B group vitamins, another notable helper for kids with autism. Caveat: Don’t give more than indicated for your child’s weight, and use these in the morning or early afternoon, not in the evening. If your child uses medications, check with your pharmacist or doctor on when to take a new supplement: Some drugs impede nutrient absorption, and vice versa. 2 – Another missing piece is healthy fats for good brain and nerve function. Kids eating mostly processed starchy foods get nearly no healthy fats and oils, which are essential for the human brain to grow and function. Along with upping your servings of nuts, nut butters, seeds (sunflower, pumpkin, flax), meats, eggs, or olive oil, give your child an omega 3 fatty acid supplement daily. Use about 1000mg to 3000mg of mixed “DHA” (docohexaenoic acid) and “EPA” (eicosapentanoic acid). Choose a high quality brand carefully screened for mercury and potency, such as Pharmax, Spectrum Essentials, Nordic Naturals, or Barlean’s. Barlean’s makes a product even picky children like called “Omega Swirl” which is good on pancakes, muffins, cupcakes, or just off the spoon. Caveat: Children on medications for bipolar disorder should check with their prescribers first to review safe dosing of EPA omega 3 fatty acid. 3 – Yank all processed food, sugar-added food, and junky drinks, punch, soda, and flavored waters with artificial ingredients. Period. It may sound impossible, but it isn’t. Roll up your sleeves and commit to your child’s better health and functioning. Artificial ingredients like colorings, dyes, fake sweeteners, corn syrup, genetically modified foods, and flavorings have been linked to ADHD, behavior challenges, and even organ damage. High fructose corn syrup has been found to contain mercury, leftover from its processing. Map a plan that you can live with to replace all those convenient snack foods and frozen items, and switch in real whole foods – organic if you can afford it. Take on as much as you can – even a few more servings of real, wholesome food over processed empty food will begin to help your child each week. Even if you can only manage removing all foods and drinks with high fructose corn syrup, it’s worth the effort. 4 – Ready for more? Trial an elimination diet, by eradicating all dairy protein (casein, whey), all gluten (wheat, rye, some oats, barely, and more). Starting with gluten makes sense simply because there are so many gluten free versions of food now available, from pasta and bread to pie crusts and pretzels. Then work on the milk, cheese, butter, yogurt, ice cream – any and all sources of foods made with cow’s milk or cheese have to go. Substitutes for cheese and milk are a little trickier, but still workable (Note: Do not switch in soy milk or soy yogurt!). These foods cost more, but you may be saving money in the long run because of your child’s improved health and functioning. Give this trial at least 5 months, no cheating. See Special Needs Kids Eat Right for more on why soy can cause your intervention to fail, the rationale for elimination diets, and how to implement them successfully. 5 – Gut it – That is, get your child’s gut functioning optimally. If your child is dependent on medications for constipation and reflux, then it’s time to clean house. Talk with your doctor about how to wean off of those nutrient-robbing medications. If no alternatives are offered, see Special Needs Kids Go Pharm Free for strategies to help your child have normal bowel function without prescription medications that interfere with nutrition. A simple start: Give a chewable high potency probiotic daily like Klaire Labs Prodegin, daily for 2-3 months. If no progress and those medications are still needed, consider talking to a naturopathic doctor (ND) for more ideas. To supplement our “Diet and Health Corner with Judy,” here are a few resources to get you started on your journey through dietary and biomedical interventions.